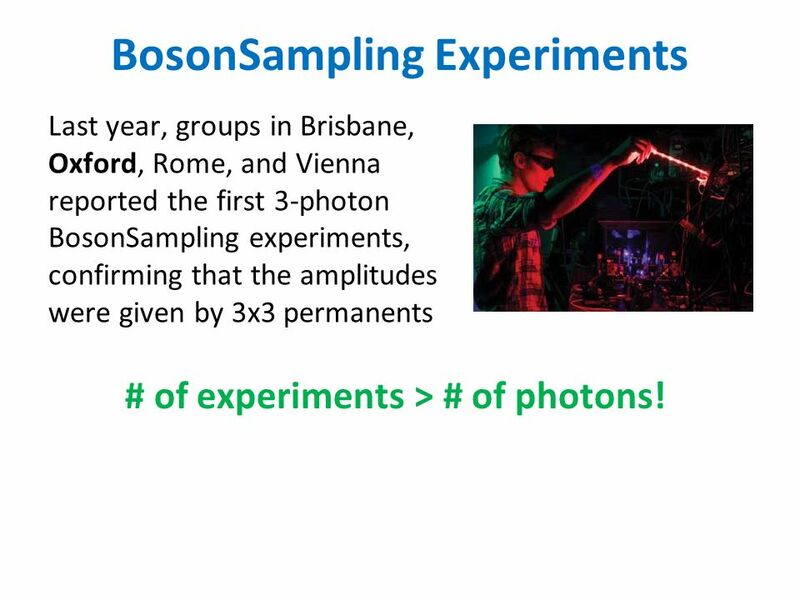 BosonSampling Scott Aaronson (MIT) Talk at BBN, October 30, 2013. 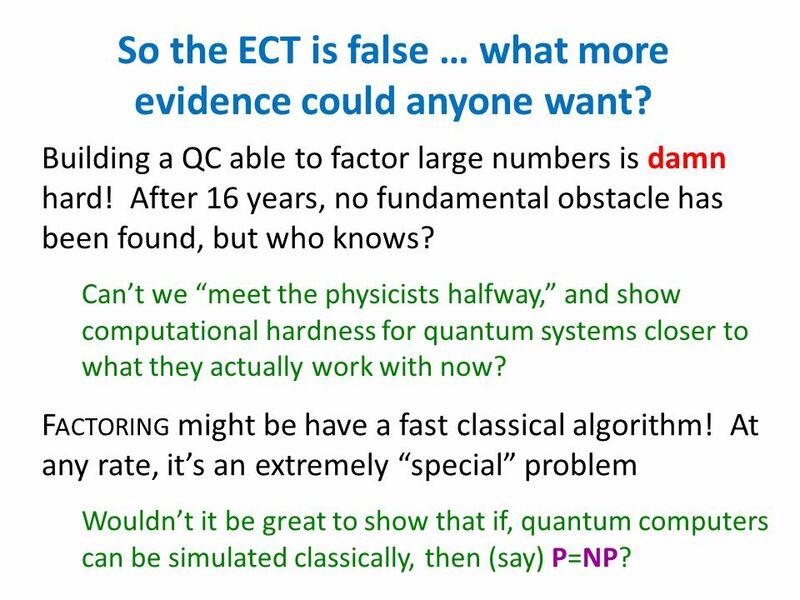 3 So the ECT is false … what more evidence could anyone want? Building a QC able to factor large numbers is damn hard! After 16 years, no fundamental obstacle has been found, but who knows? 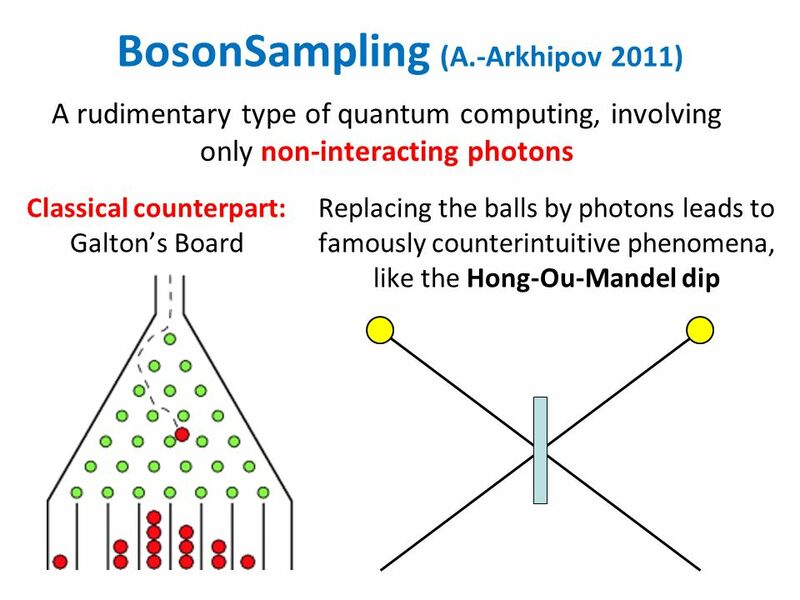 Cant we meet the physicists halfway, and show computational hardness for quantum systems closer to what they actually work with now? 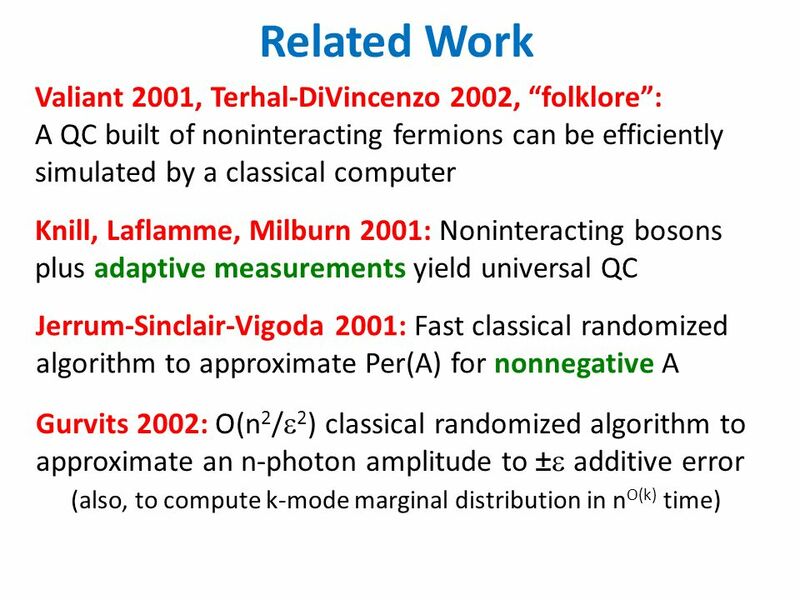 F ACTORING might be have a fast classical algorithm! 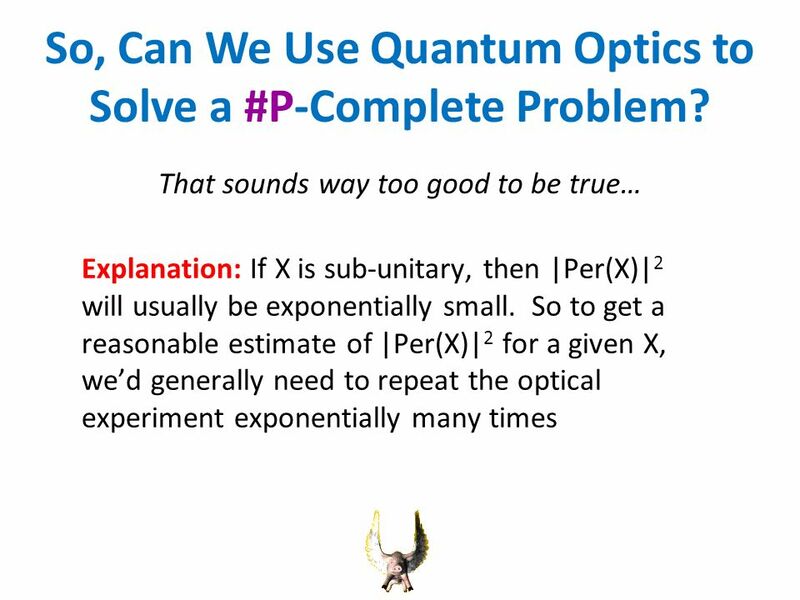 At any rate, its an extremely special problem Wouldnt it be great to show that if, quantum computers can be simulated classically, then (say) P=NP? 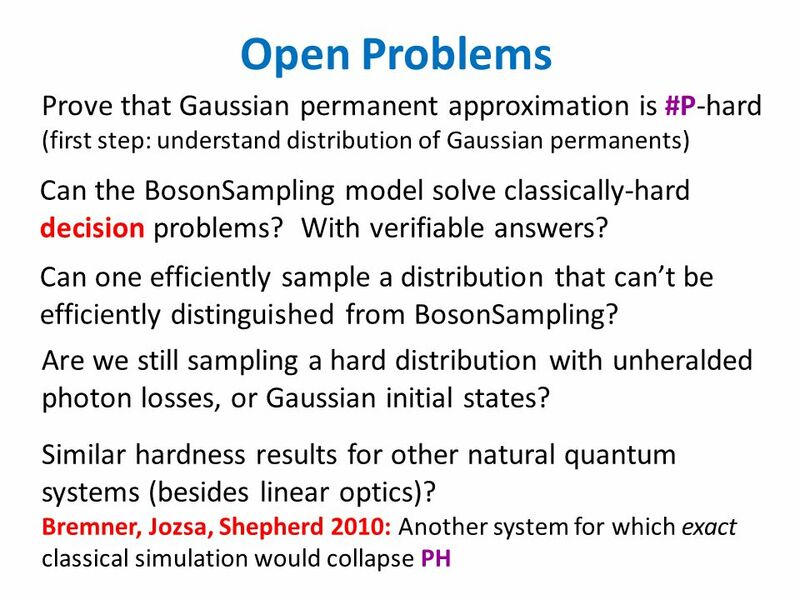 18 Open Problems Similar hardness results for other natural quantum systems (besides linear optics)? 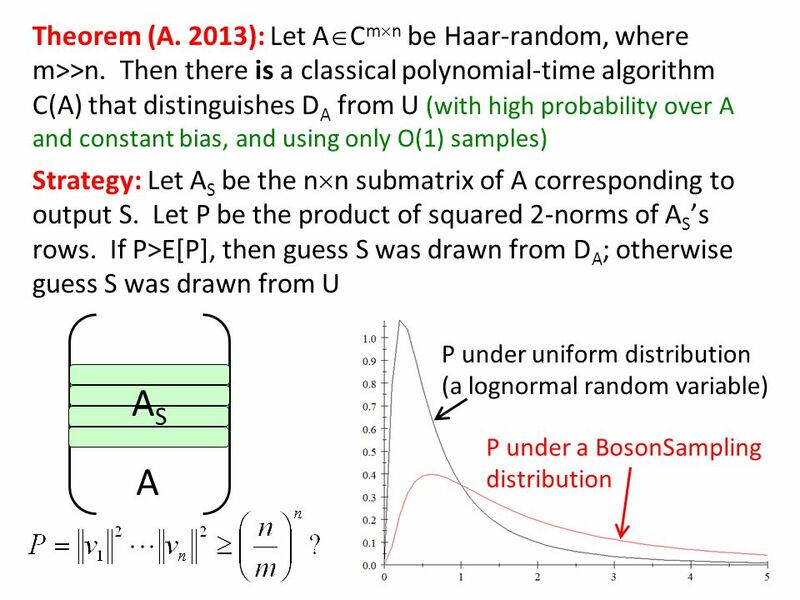 Bremner, Jozsa, Shepherd 2010: Another system for which exact classical simulation would collapse PH Can the BosonSampling model solve classically-hard decision problems? With verifiable answers? 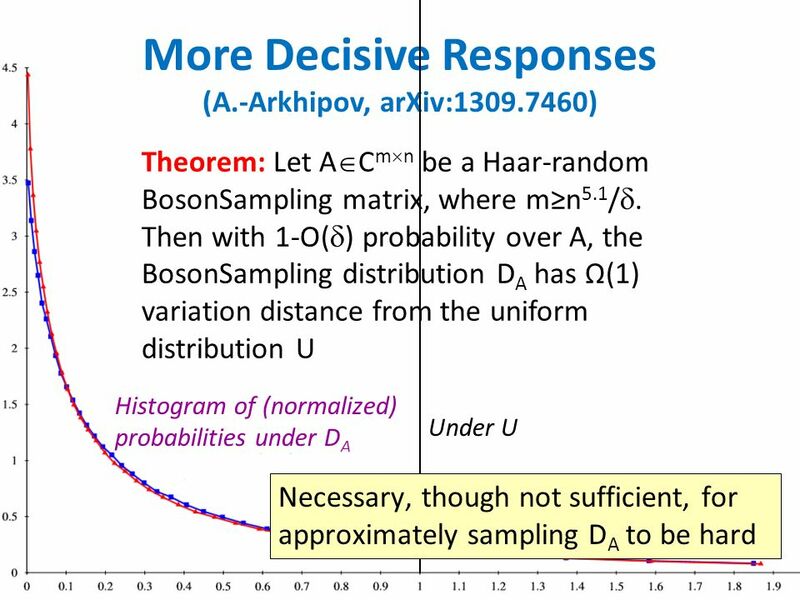 Can one efficiently sample a distribution that cant be efficiently distinguished from BosonSampling? 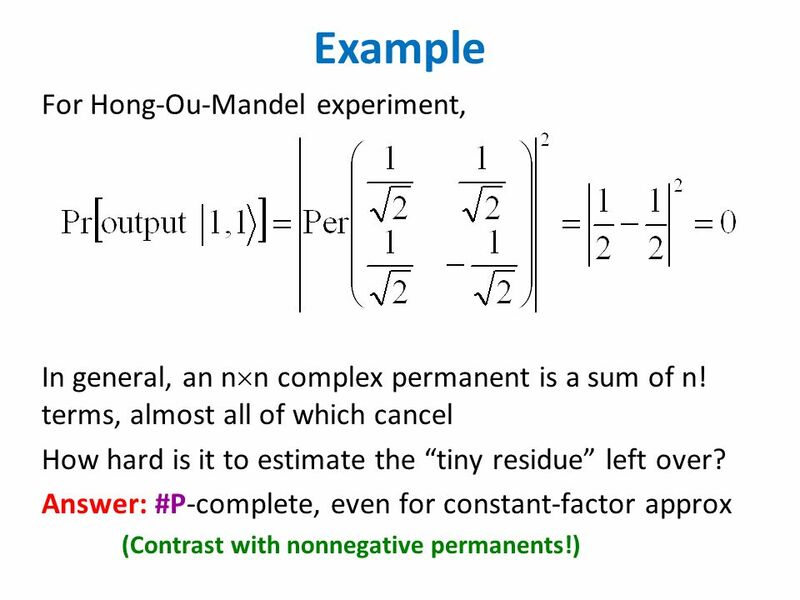 Prove that Gaussian permanent approximation is #P-hard (first step: understand distribution of Gaussian permanents) Are we still sampling a hard distribution with unheralded photon losses, or Gaussian initial states? 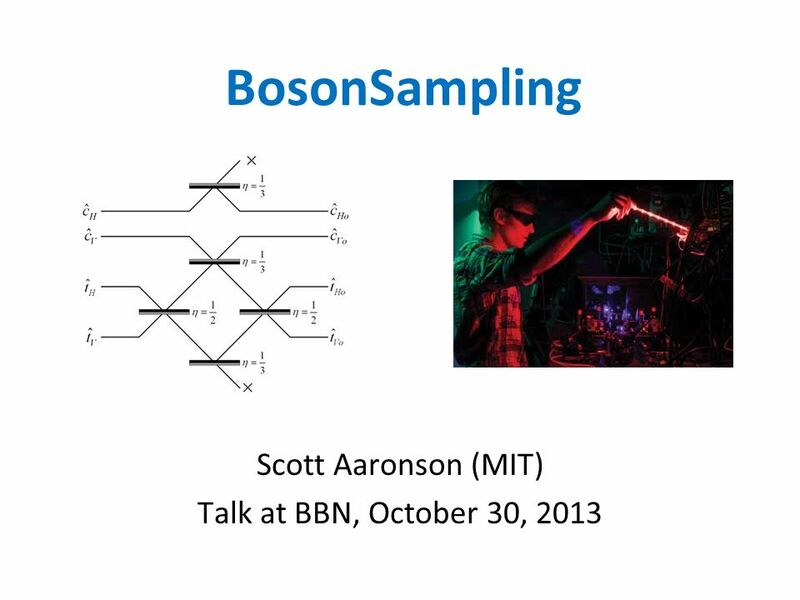 Download ppt "BosonSampling Scott Aaronson (MIT) Talk at BBN, October 30, 2013." 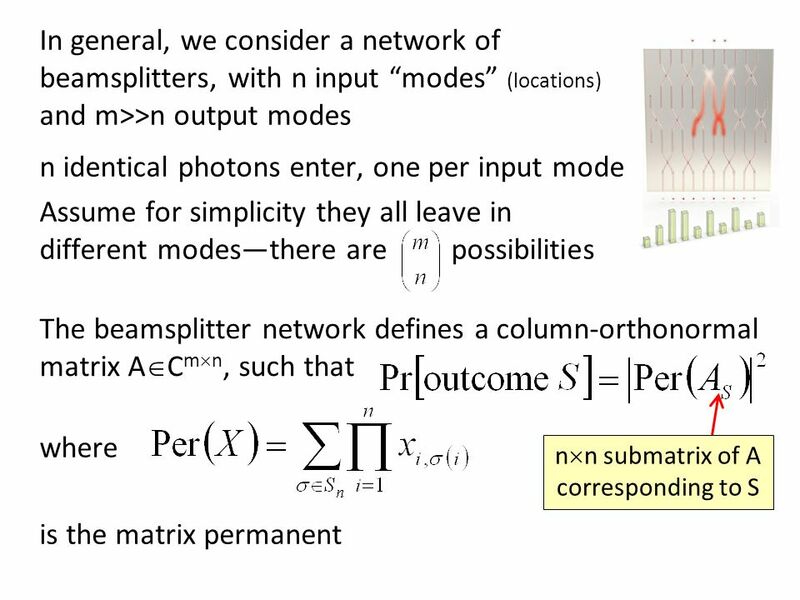 Multilinear Formulas and Skepticism of Quantum Computing Scott Aaronson UC Berkeley IAS. 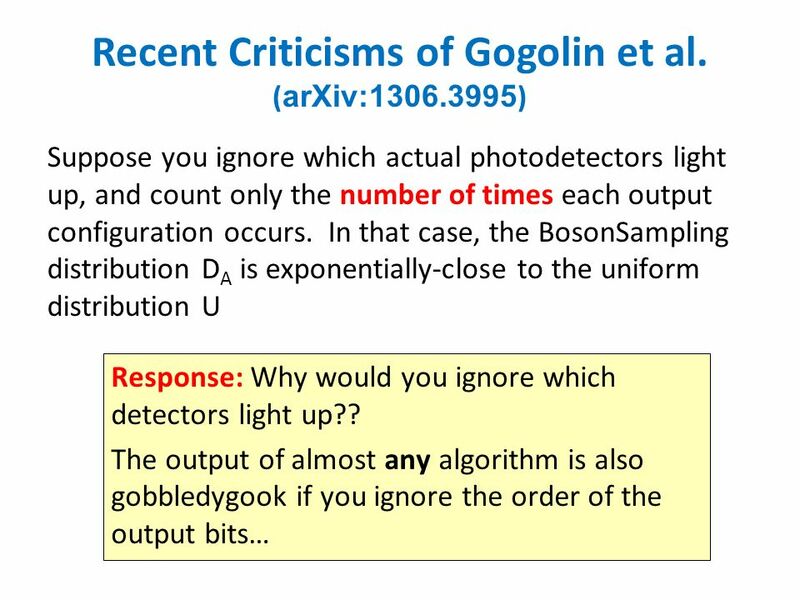 Limitations of Quantum Advice and One-Way Communication Scott Aaronson UC Berkeley IAS Useful? An Invitation to Quantum Complexity Theory The Study of What We Cant Do With Computers We Dont Have Scott Aaronson (MIT) QIP08, New Delhi BQP NP- complete. 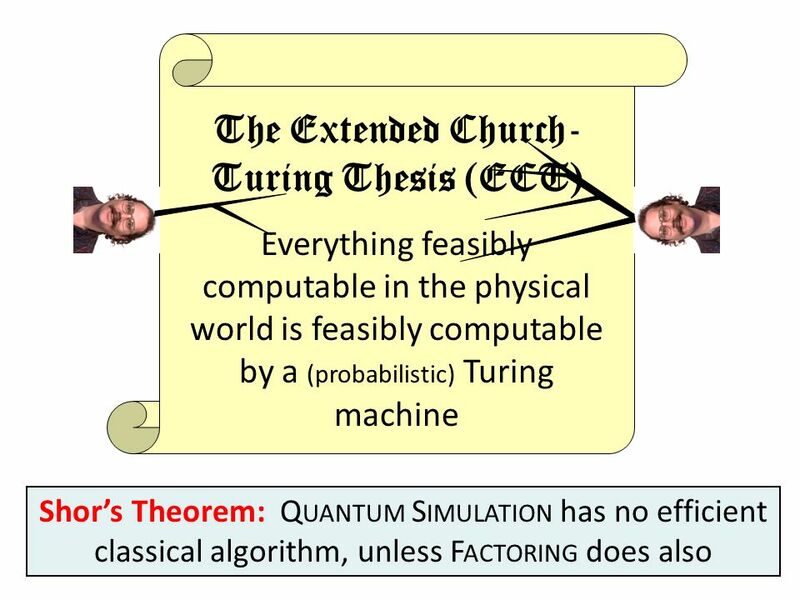 New Evidence That Quantum Mechanics Is Hard to Simulate on Classical Computers Scott Aaronson Parts based on joint work with Alex Arkhipov. 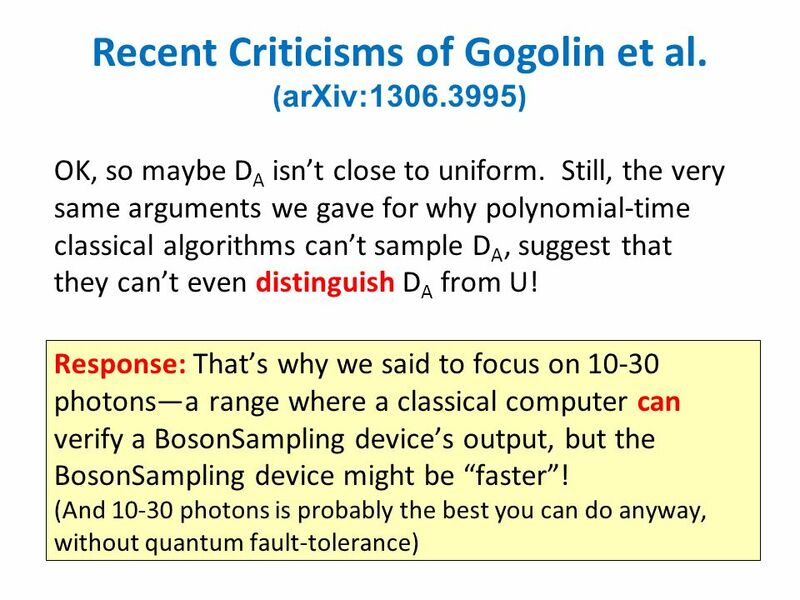 How to Solve Longstanding Open Problems In Quantum Computing Using Only Fourier Analysis Scott Aaronson (MIT) For those who hate quantum: The open problems. 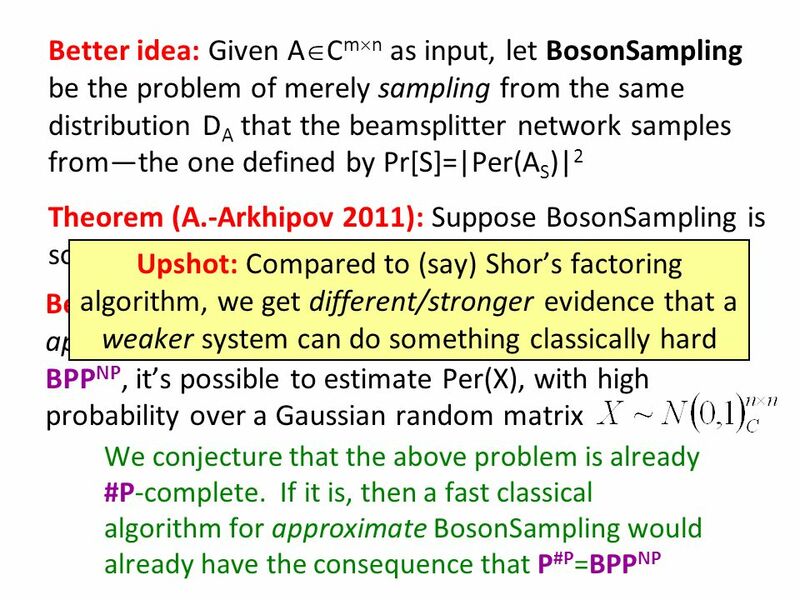 Scott Aaronson BQP und PH A tale of two strong-willed complexity classes… A 16-year-old quest to find an oracle that separates them… A solution at lastbut. 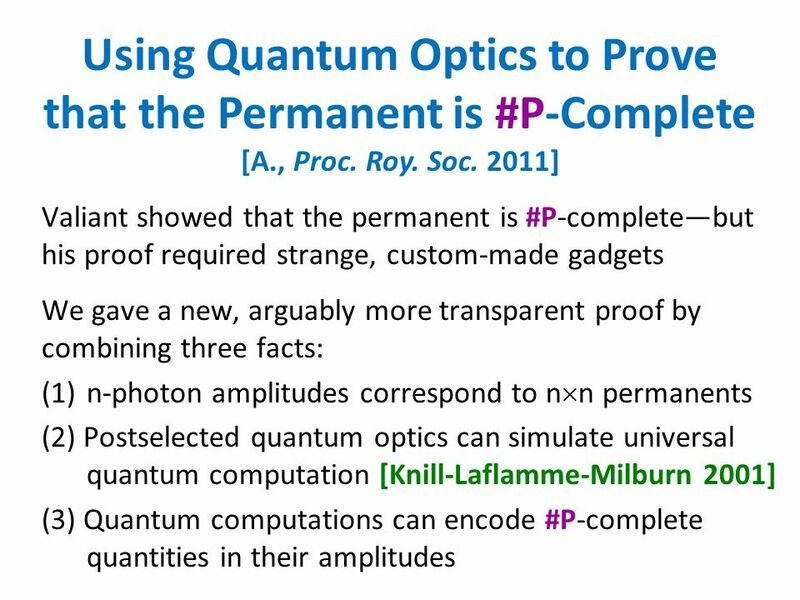 QMA/qpoly PSPACE/poly: De-Merlinizing Quantum Protocols Scott Aaronson University of Waterloo. Computational Complexity and Physics Scott Aaronson (MIT) New Insights Into Computational Intractability Oxford University, October 3, 2013. 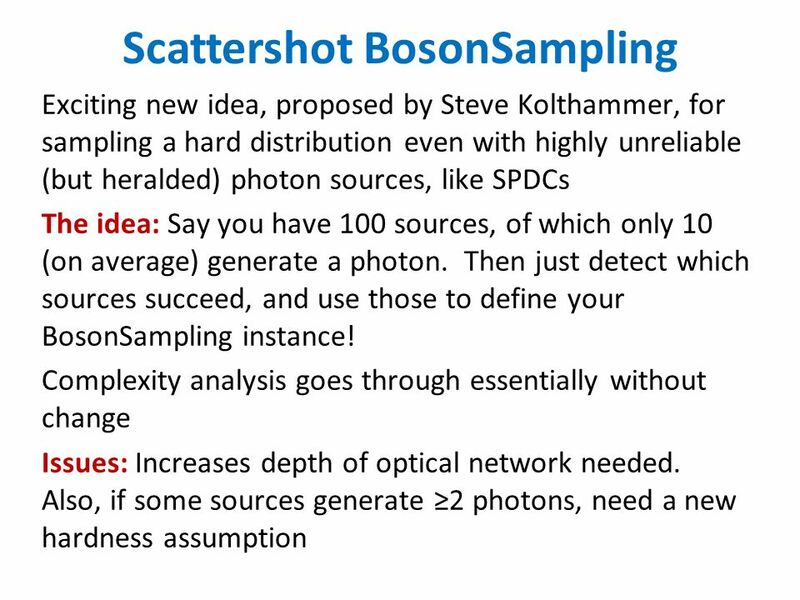 The Equivalence of Sampling and Searching Scott Aaronson MIT. 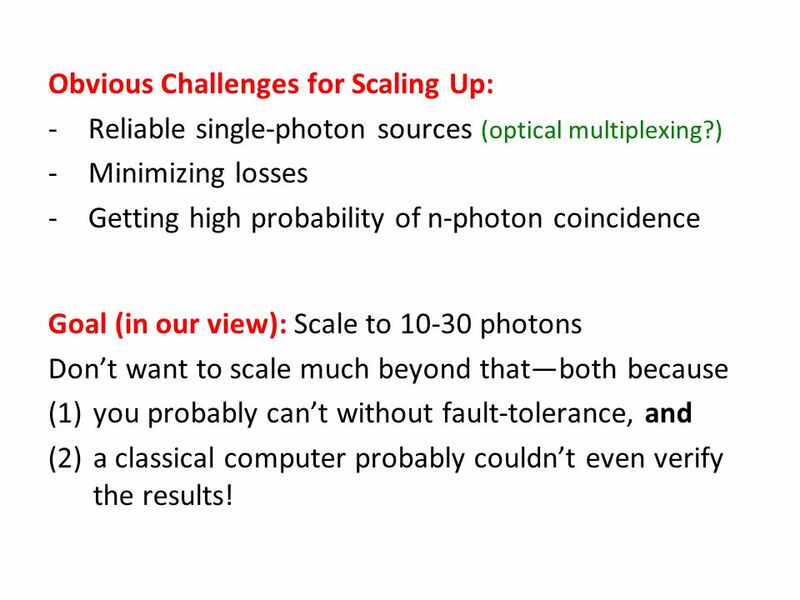 The Computational Complexity of Linear Optics Scott Aaronson and Alex Arkhipov MIT vs.
Scott Aaronson (MIT) BQP and PH A tale of two strong-willed complexity classes… A 16-year-old quest to find an oracle that separates them… A solution at.